How tragic is the story of the life of the paralytic. A man had been paralysed for years. He lay at a short distance from healing, but he himself had no strength to merge into the waters of cleansing. And no one – no one in the course of all the thirty eighth years and more – had compassion on him. Everyone who was sick rushed to be first in order to be healed. Others, who were attached to those suffering by love, by friendship, helped them to be healed first. But no one cast a glance at this man, who for years had longed for healing and was not in himself able to find strength to become whole. If only one person had been there, if only one heart had responded with compassion, this man might have been whole years and years earlier. We are surrounded by people who are in need. It is not only people who are physically paralysed who need help. There are so many people who are paralysed in themselves (spiritually paralysed), and need to meet someone who can help them. Paralysed in themselves, are those who are terrified of life, because life has been an object of terror for them since they were born: insensitive parents, heartless, brutal surroundings. How many are those who hoped, when they were young, that there would be something for them in life. But no, there wasn’t. There was no compassion. There was no friendliness. There was nothing. And when they tried to receive comfort and support, they did not receive it. Whenever they thought they could do something they were told, ‘Don’t try. Don’t you understand that you are incapable of this?’ How many were unable to fulfill their lives because they were physically ill, and not sufficiently strong? Did they find someone to give them a supporting hand? Did they find anyone who felt so deeply for them and about them that they went out of their way to help? And how many are those who are terrified of life, because they lived in circumstances of fear, of violence, and of brutality? 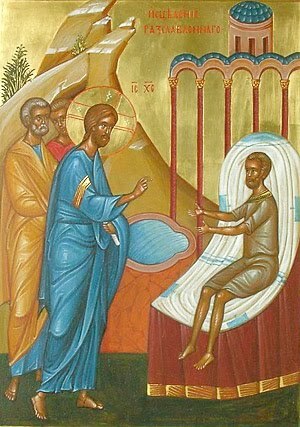 All this could not have happened to them if there had been someone who had stood by them and not abandoned them (like, Christ, who did not abandon this rejected paralytic). So, we are surrounded, all of us, by people who are in the situation of this paralytic man. If we look and think at ourselves, we will see and understand that many of us are paralysed, incapable of fulfilling all our aspirations; incapable of being what we longed for, incapable of serving others the way our heart and conscience tells us to; incapable of doing anything we long for because fear and brokenness has come into us. We are mutually responsible for one another; because when we look right and left at the people who stand by us, what do we know about them? Do we know how broken they are? How much pain there is in their hearts? How much agony there has been in their lives? How many broken hopes, how much fear, rejection, and scorn that has made them contemptuous of themselves and unable even to respect themselves – not to speak of having the courage of making a move towards wholeness. That wholeness, of which the Gospel speaks in this passage and in so many other places? Let us reflect on this. Let us look at each other and ask ourselves, ‘How much frailty is there in him or her? How much pain has accumulated in his or her heart? How much fear of life – (the life expressed by my neighbor, the people whom I should be able to count on for life) – has come in to my existence? Let us look at one another with understanding, sensitivity and with attention. We will be answerable for each other, because there are so many ways in which we should be the eyes of Christ who sees the needs, the ears of Christ who hears the cry, the hands of Christ who supports and heals or makes it possible for the person to be healed. 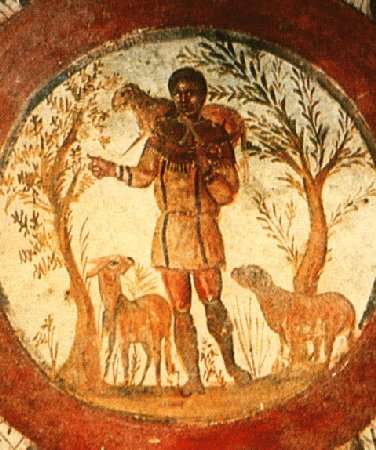 Let us look at this parable of the paralytic with new eyes; not thinking of this poor man two thousand years ago who was so lucky that Christ happened to be near him and in the end did what every neighbor should have done. Let us look at each other and have compassion, active compassion; insight; love, if we can. And then this parable will not have been spoken or this event will not have been related to us in vain. We are all in need of something, someone to come along in life and grant us that of which we wish. But if we come across someone who is in need, even more, who asks it of us to help them, and we don’t, we become like those indifferent people who passed by the paralytic and ignored him. Therefore, we have two options: the first is to follow God’s call and become like Christ, since we are created in His image, in order to grow spiritually, and mature dynamically into His likeness as Godman, through the grace of His gospel. The second option is to become like those oblivious to the gospel, which passed by the paralytic and did nothing, and remain spiritually paralysed, undeveloped, and unresponsive to the will of God. Which option will you choose? 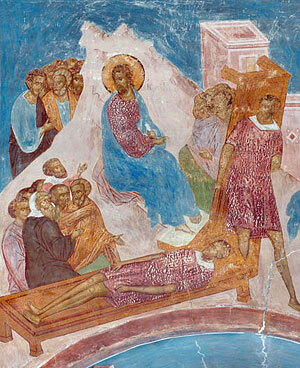 In this gospel, Jesus asked the paralytic, ‘Do you want to be healed?’(Jn 5:6). 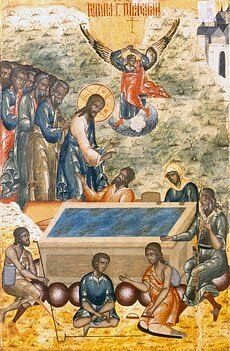 The paralytic answered, ‘I have no man to put me into the pool when the water is troubled’ (Jn 5:7). 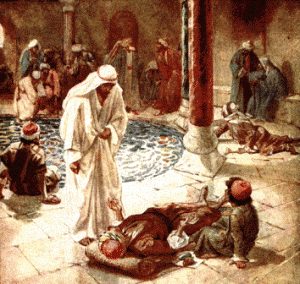 In other words, the paralytic could only think of the healing energies of the pool. Without a doubt, the paralytic hoped that Jesus would offer to perform this task of helping him into the pool, when the supernatural troubling of the waters occurred. Christ, however, did nothing of the kind. 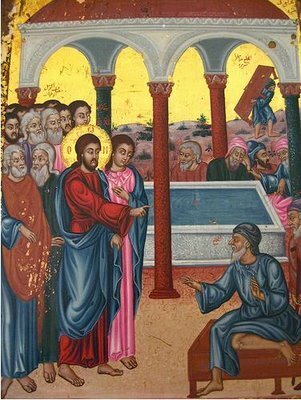 Instead, He called the paralytic man to stop looking to the pool for healing and salvation, and to look instead to Him. 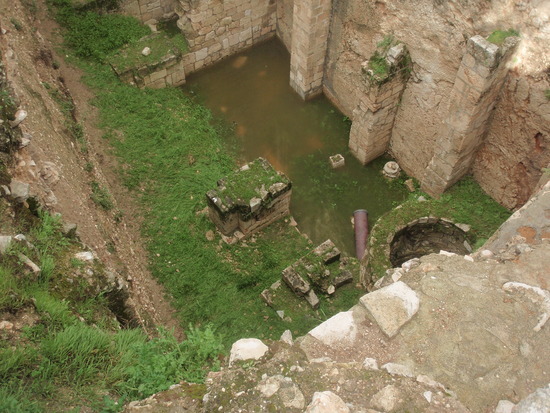 He, Jesus, was the source of salvation – not the pool. 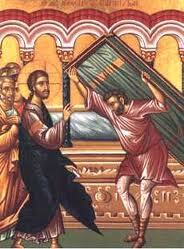 Jesus simply said to the man, ‘Take up your pallet, and walk’ (Jn 5:11). 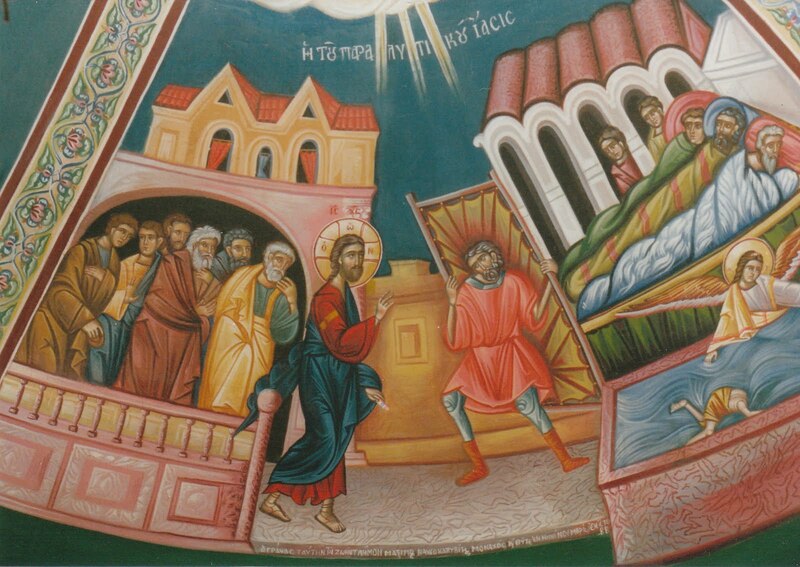 The healing and creative words of Christ, which is His gospel, took effect immediately, and the man became healthy and obediently took up his pallet and walked; from his inert state, the paralytic received movement again. Afterwards Jesus found Him in the temple glorifying God (Jn 5:14); this means, that those who receive proper movement towards wholeness, or good order, are those who are orientated to God, to His will or path, and therefore give Him glory, as they rejoice in their holistic experience of Him. Hi, I found this website from digg. This is not a blog post I would regularly read, but I loved your perspective on it. Thanks for creating an article worth reading!